They began airing the weekly broadcast on Sunday, April 3, 2016. Previously they had hosted a similar syndicated show called “Blind Matters.” The current program airs live out of a studio in Ocoee, Fla., a small town on the outskirts of Orlando. It runs Sunday evenings from 7 to 9 p.m. Eastern time on 1680 WOKB-AM. It can also be heard online at www.wokbradio.com, on the TuneIn Radio mobile app, and on the WOKB mobile app. The show is also available by phone at (518) 712-0057. Podcasts are available free at www.blindandbeyondradioshow.org. And you can call into the show live at (407) 894-1680 to add your two cents about any relevant topic. The show offers a variety of content. From interviews with movers and shakers in the blind community, to inspirational quotes and poems, to trivia, the word “beyond” is important to remember because of the unique mix the show has to offer. In addition to the Golders, producer Chris Shaw, who sits behind the glass, is the true heartbeat of the program from a technical standpoint. You’ll hear an array of guest co-hosts each week, including FCB members like Sheila Young, Gary Sinclair, and Charles Brooks. Michael has a reputation for his affection for ‘50s and ‘60s music, particularly hits by Ricky Nelson, Bobby Darin, and Paul Anka. So, if you listen to “Blind & Beyond,” there’s a good chance you will hear a song from this era when he asks listeners to identify an artist during a “name that tune” trivia segment. Michael, originally from Philadelphia, and Lynne, who calls herself a Jersey girl, joined the Greater Orlando Council of the Blind in early 2012 and have been members ever since. The couple also does full-time sales work for some radio stations in Orlando. 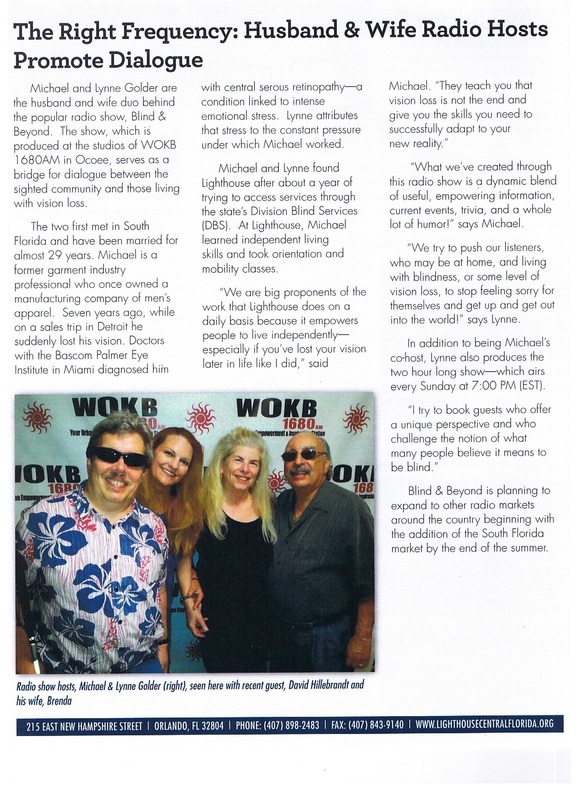 Michael is Vice President of Advertising for WOKB and Brazil Radio AM and FM. Along with taking her husband all around central Florida to meet with potential on-air advertisers, Lynne writes and records the commercials for the stations. Michael previously owned a men’s clothing company for over four decades, where Lynne worked as the head designer. After suddenly losing a good amount of his sight while on a sales trip in 2008, ophthalmologists at Bascom Palmer Eye Institute in Miami diagnosed Michael with idiopathic central serous retinopathy. However, he has received varying opinions on the ultimate cause of his vision loss and has undergone a few procedures. Fortunately, as luck would have it, his wife was looking out for him – in more ways than one – and spotted a small job posting that would lead to a future successful career for the couple. Michael would later get an hour-long show on The Big 810 AM in Orlando. This was the birth of “Blind Matters” in April 2012. This show would eventually expand to three hours and several major markets around the country. It was Budweiser that served as its original sponsor. Lynne spends many hours each week researching potential guests, content, and advertisers for the broadcasts. And Sunday night certainly comes around quickly each week. Lynne says the loss of Michael’s vision and the involvement in two radio shows about blindness have both been big eye-openers for her.